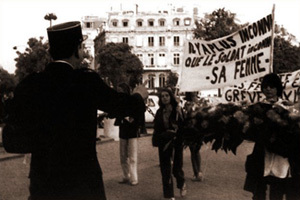 Discussion/debate, Saturday 31st of October at 12 noon → Women artists - a double handicap? The title is slightly provocative in order to raise the issue of woman and lesbians in the art world. We might have hoped that creation and culture were synonymous with less sexism. Yet filmmakers, video artists, painters, visual artists, musicians, theatre directors and photographers made invisible by History, remain under-represented. Where do things stand now? 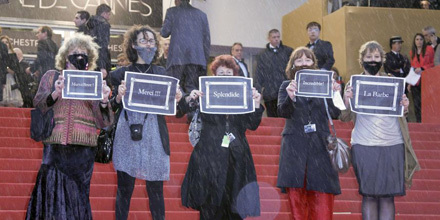 Are women better-represented in institutional events? And what happens when a "lesbian" project is put forward? 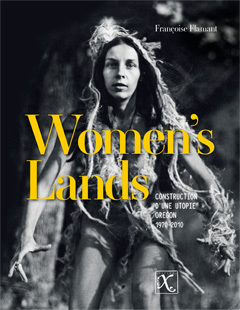 On the occasion of the release of Françoise Flamant's Women's Lands - Construction d'une utopie Oregon 1970-2010 (éditions iXe), an encounter with Françoise Flamant and a slideshow screening. This work represents a real documentation of these lands that, for the last thirty years, have been settled, cared for, and protected by lesbians. Ways of settling the land, ways of life, ways of resolving conflicts, cultural creations, questions of the transfer of land from person to person...a wealth of themes are addressed in this book which is well-deserving of this showcase at Cineffable. Forty years have gone by since women - feminists and lesbians - first settled in remote Oregon to clear land and construct houses and cabins as part of their plan to develop a new way of living amongst themselves, far from masculine dominance. At the beginning of the 1980's around twenty of these properties had permanent residents as well as numerous visitors passing through. An intense social life was able to develop, based on networks of mutual aid, the exchange of knowledge, the development of a new culture and the search for a spirituality inspired by the Earth and the Cosmos. At the beginning of the twenty-first century, several of these places still exist, others have disappeared, and yet others have changed and evolved. The author consulted archives, visited the lands still being actively worked today, and collected the accounts of the women who dared to live their utopia. Now she tells their story. All the international filmmakers present at the festival this year will be there to present their films, their work, their projects and respond to your various questions. So come meet the filmmakers! Discussion/debate, Sunday 1st November at 2:30 pm → Feminism(s): what do we do with this Herstory...? Echoing the issues raised in the French film Je ne suis pas féministe mais..., the documentary about Christine Delphy, one of the founders of the French women's mouvement, and other films addressing our history and our struggles, (She's Beautiful When She's Angry (opening film), Vessel (closing film), Solar Mamas, Casablanca Calling, At Home, in Bed and in the Streets...) we present here a look at our struggles past and present; because as Christine Delphy highlights in the film, "nothing is better than discussion for advancing thought."